EM Softball Specific Training – Run Faster, Hit Harder, Get Stronger! > There were 28 EM Athletes in this years Womens College World Series! > 3 EM Athletes are represented on the Womens USA Olympic Team and 6 on the USA Elite Team. 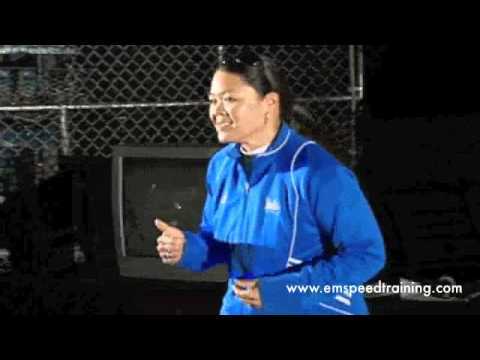 Often copied, but never duplicated – For the past 10 years, EM’s Softball Training continues to teach the form and mechanics needed to generate your explosive first steps and get an immediate advantage over your opposition. EM is far and away the best softball specific training you can get. Team USA Players, Division 1 College Athletes, High School down to 10U players are training at EM to get the advantage that has given them more success in their sport. Pro Softball’s and back to back Pac12 batting champ at UCLA – Chip Bennett attributes her speed and athleticism to EM! Your EM Speed Trainers are former Collegiate or Professional Athletes with a kinesiology background and certification from a National Governing Sports Performance Body. Check out this ESPN piece with EM Athletes showing their explosive speed – one of the faster ones is Brejae Washington of the Texas Longhorns seen slapping and blazing a 2.66 down the line..
You can also get Specific lessons for Slappers, Pitchers, Fielding and Outfield position play done by some of the top independent skill coaches in the softball industry conveniently located in an EM near you. Back when they were in high school, these Division 1 College and Professional Fastpitch stars got the tools they needed to make an impact at EM! Last year 8 of the 10 top hitters in the SEC are former or current EM / STC Athletes. Dawn Castañeda is personal batting instructor located in Rancho Cucamonga. Over the course of her coaching career, she has been improving the lives of many dedicated female athletes. Dawn’s strengths include working with and understanding young women in all aspects of life, on and off the field. When it comes to softball, she has taught everything from details in hitting, defense and strategy. Dawn enjoys breaking things down, so that all students are able to learn all parts of the game. She admits it takes an enormous amount of discipline and determination, but with these characteristics each student will be able to be responsible for achieving their personal goals.Her experience playing the game includes: Bishop Amat, Azusa Pacific, So Cal Invaders (16u), Gordon’s Panther’s (16u), Crackerjacks (18u), Bongo (Women’s Division), Legacy (Women’s Division), Shilo’s (Women’s Division). Dawn holds a bachelor’s degree in Physical Education from Azusa Pacific University (’97). Immediately following graduation she began her coaching career, she has taught and coached at the following schools: Rosary High School (Asst. Varsity Coach), Azusa Pacific University (Asst. Coach), Northwestern State University (Asst. Coach), St. Lucy’s Priory High School (Varsity Head Coach), Cal State San Bernardino University (Head Coach), Pasadena High School (Asst. Varsity Coach). She recently accepted a job offer as a Varsity Assistant coach back where it all began, Rosary High School. In her spare time, Dawn also coaches travel ball with Strike Force Gold (18u-Guerra). Her experience includes: Tuff-e-nuff (16u-Guerra), Cal Thunder (18u-Guerra), American Pastime (18u-Zerkle), American Pastime (Women’s Division-Zerkle), and Softball University Force (14u-Castellanos). A 2-time Olympian and a 3-time College World Series Veteran Di Salvio grew up in Corona, California and attended Corona High School, where she was recently inducted into the high school hall of fame. As a four-year starter on the Corona High team, Di Salvio was selected to the all-state first team by Student Sports Magazine her senior, junior, and sophomore years. She was a four-time All-CIF and First Team Mountain View League performer as well as league MVP in both 1995 and ’97. After high school, Di Salvio attended the University of California, Berkeley on a full athletic softball scholarship. As a four-year starter at pitcher, she owns the CAL record with nine career saves. She is only the fifth pitcher in CAL school history to throw two no-hitters in the same season. As a senior she tossed three no hitters and two perfect games. Di Salvio earned Regional All-Tournament honors all four years as well as All-tournament teams at both the National Invitational Softball Tournament and the Bank of Hawaii Tournament. She was also named to the All-Pac – 10 Softball teams and All Pac –10 academic teams while at CAL. After completing a Bachelor’s Degree from CAL, Di Salvio went on to earn her multiple subjects teaching credential from UC Irvine and her Master’s Degree in Physical Education from Azusa Pacific University. She is currently the Head Softball Coach at San Bernardino Valley College and was also part of the coaching staff for the Women’s Softball Team at Fullerton Junior College from 2002 to 2004. Nicole will be conducting lessons on Wednesdays and Thursdays at the EM Speed and Power Training Facility in Rancho Cucamonga. *Lessons at EM are administered by independent contractors licensed to use space in EM and STC’s facility only. Lesson coaches are not employed by EM.